Ideally located in the heart of the residential area; in the main shopping and business districts, 20 miles from the airport. The Jerusalem International Hotel is a first class hotel ideally located in the heart of business, shopping and exquisite residential district of Amman. 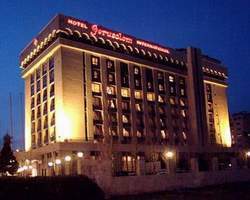 The Jerusalem International Hotel is not just a place to spend the night, but with its unique hospitality and 175 elegantly furnished and decorated rooms, 10 junior suits and 2 Royal suits overlooking the city, it becomes more like a home for business and leisure travelers . Each room has a private bathroom, independent air conditioning, satellite TV, and two telephone lines. The cool interior of the hotel accommodates restaurants and lounges to suit all tastes. Jerusalem International Hotel high standard will meet your needs and expectations. Al-Yarmouk restaurant opens all day and night offering fine dining options, hot and cold buffet meals. Guests may relax and have a drink in Jerusalem International Hotel Ahlan-wa-sahlan lounge. You may dance the night away in the exclusive surroundings of the Al-Andalus nightclub, which often feature famous artists. The Al-Khaimah bar Terrace offers delightful snacks enhanced by soft heart-felt music to assure your entertainment. The Jerusalem Hotel International is well equipped for hosting business and social gatherings of every description having two fully equipped meeting and banqueting rooms including Royal Hall holding up to 400 persons and AL-JaLiL Hall with a capacity up to 150 persons. Jerusalem International Hotel well- trained consultants can help you plan almost any event down to the crucial details. They also help in suggesting coffee breaks, wedding parties and make sure that our support staff is on hand to maintain a smooth running of your function. The health club offers excellent state-of-the-art fitness and recreation facilities with beauty services from massage to facials. Tennis, squash, indoor/outdoor swimming pools – near by.